In February of 2015, DifferentDream.com published a guest post by psychologist Liz Matheis about stress, PTSD, and parents of kids with special needs. Reader response to the post was overwhelming and led to a survey about special needs parenting stress. The survey findings resulted in a series about PTSD and special needs parenting and many, many more questions from parents. Different Dream’s Jolene Philo and guest blogger Dr. Liz Matheis have teamed up to create a new weekly series about special needs parenting stress, trauma, and PTSD. The series begins today and will end when your questions run out. We’ll be using a Q & A format to answer questions from readers. To kick off the series, Jolene asked Dr. Liz to answer this question posed by the mom of an adult child with autism: So, I am not the only one who feels like this? Below is Dr. Matheis’ answer, along with a brief definition of special needs parenting stress, trauma, and PTSD in parents–sometimes called secondary stress, trauma, or PTSD. You’re a parent of a child with special needs. You have a diagnosis, you’ve sought treatment and you’ve been doing this for a couple of years. 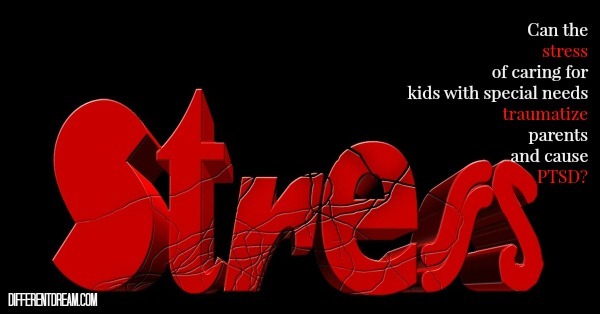 As your child grows and his needs change, so does your stress and distress. You now know enough about your child’s triggers that you survey the environment and sit in anticipation of a potential meltdown. You’re on the edge a lot. You aren’t very good at ‘letting go’ because you don’t know what you have to accommodate or change in your house, in someone else’s house, or with someone else in an effort to keep your child regulated and calm. Over time, this pattern of stress becomes a part of your life, it becomes chronic. And with that, when you hear another parent share her journey, you often find yourself getting lost in your own memory of when you first learned of your child’s diagnosis, and the immensely strong emotions , grieving, relief, sadness, and potential acceptance that you have journeyed through. You flash back to when you had to restrain your child, accept your child’s punches, head butts, pinches. It hurts, but the physical hurt is far less than the emotional hurt. Yes, you are traumatized, but please don’t be ashamed. You are not alone. Your experience is real. It is not in your head. It’s okay to admit to yourself that you feel alone and lonely despite being surrounded by professionals. It’s okay to want to take a break, or even run away. Technically, secondary PTSD involves re-experiencing traumatic experiences through vivid recall of memories during the day. That re-experiencing can be sudden and without an obvious trigger. It can be due to an odor, a word, a color with which you have developed an association. The re-experiencing comes with intense emotions, such as guilt, fear or even anger. And because the re-experiencing can be so overwhelming, you may find that, as a parent, you try to avoid certain places, people, clothes, odors so that you just don’t go there. You may also find yourself feeling hypervigilant. What that means is that you function with a high level of anxiety and arousal, which can result in difficulty sleeping, poor focus, and being easily startled. You may also feel irritable and worry about your safety and the safety of your child/children. Your spouse or other children may even perceive you as being easily frustrated or being angry often, but the truth is, you are spent. Have some questions about special needs parenting stress, trauma, or PTSD come to mind as you read what Liz had to say? If so, you’re invited to leave them in the comment box for Liz to answer in future installments of this series. We look forward to hearing from you and exploring this important topic in the weeks to come. To learn more about Dr. Liz’s practice visit www.psychedconsult.com for more information. Connie, that’s an excellent question that takes a book to answer it completely. My 13 part series about PTSD in kids addresses your question, too. The first post can be found at this link. At the bottom of the page you’ll find links to all the other posts in the series. You might also want to get a copy of Does My Child Have PTSD?. Just go to the “Buy the Book” page on this website, click on the book image, and it will take you to Amazon. You will find much more information in the book than in the series. I hope that helps! My child is special needs (a deletion in a chromosome). He also was adopted because her mother abandon him when she got birth. Even though it was a close adoption I know the mother live in the streets and she didn’t want her child. When I visit at the hospital I heard she leave the baby crying of hunger because she did not want to breast feed him. Two days after she was at home, and always talk to him about how much God love him and we always show him so much love in spite of his disabilities. Now, with her chromosomal condition she is not verbal and he has autistic behavior. How do we know he also suffer from PTSD? He is 7 yrs. old. but mentally is like 2 yrs. old. Nina, your questions are welcome whenever you’re able to form them. Each post in the series will invite readers to ask questions, too. Perhaps one of the future posts will help you frame your thoughts into a question to submit at a later date. I hope so, Sylvia. Thanks for stopping by. I’ve read this post several times trying to get my thoughts to form questions. There were triggers for me and my heart cringed and cried. I have to keep in auto pilot mode so often to tend to family, getting questions to come is hard, yet they are there. Hyper vigilant, intense emotions, spent, avoidance, anxiety, lonely, describes it well at this time. I’m sure this is going to be a great help to so many people! Another excellent question for Dr. Liz. I’m so sorry to hear about your PTSD. Hopefully, this series will give you answers and help you cope. I am a single parent, as many special needs parents are. The only break I get is when my child is in school or camp. What advice can you give parents who do it all themselves and have very little if any outsde help? I am sure I suffer from PTSD. That’s a really good question, Heather. I’ll pass it along to Liz, and we can both look forward to reading her answer. When is respite a good idea?